As warm weather approaches and you gear up for golf events, consider the power of partnering up the pleasantries of the game with the appeal of eco-friendly imprinted products. After all, nine out of ten consumers say they’re concerned enough about the environment to buy green. That concern could easily translate to a huge majority of the 30 million golfers in the United States who spend whole afternoons in the great outdoors. Fortunately, there’s a growing abundance of ecologically minded options available for golf promotions. Here are a few choices and applications to help you score below par with your target audience. Make an earth-friendly mark with Tee-Gee recycled denim golf pencils. These smart writers are created from 20% to 30% reclaimed denim. This small token allows you to send a lumpy direct mail piece (using recycled paper, of course) that signs up players for a day on the links with an earth-friendly message to boot. Go for the corn-fed promotion. NatureAd™ golf tees are made of 100% corn-derived plastic. That means that this little golf necessity won’t pose any global threat in great quantity because it’s a natural resource, replacing petroleum-based plastic tees. They’re even biodegradable. These are perfect for golfing events at courses that are embracing environmentally friendly course management, a growing trend in the United States and abroad. Dress for eco-friendly play. 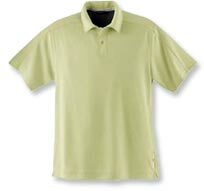 Golf shirts have gone green – they are now available in organic cotton and bamboo. Recycled plastic visors provide protection for players and the environment. Pass out these gifts in hemp tote bags with a note that expresses your corporate philosophy to protect natural beauty surrounding the course in style. Re-charge executives with a bag that gives back. For a special gift or an incentive reward consider a golf bag with built-in solar panel. The integrated power source is fueled by the sun on the golf course and can then power up a player’s cell phone, iPod or Blackberry in an earth-friendly manner. How better to complement a message that thanks workers or clients for sustaining growth and the power of partnership? So, go for the green with your next golf event…pairing play with a seriously important message. We can help you source the above products (or numerous others), as well as create a green message perfect for your occasion. Just give us a call at 708-478-8222 or send us an e-mail!